Sorry for the late notice, but I noticed the following announcement on WLBT this morning. The station reported it as a “demolition ceremony”. Although the current Blackburn will soon be demolished to make room for the almost completed new Blackburn, no demolition will take place today. 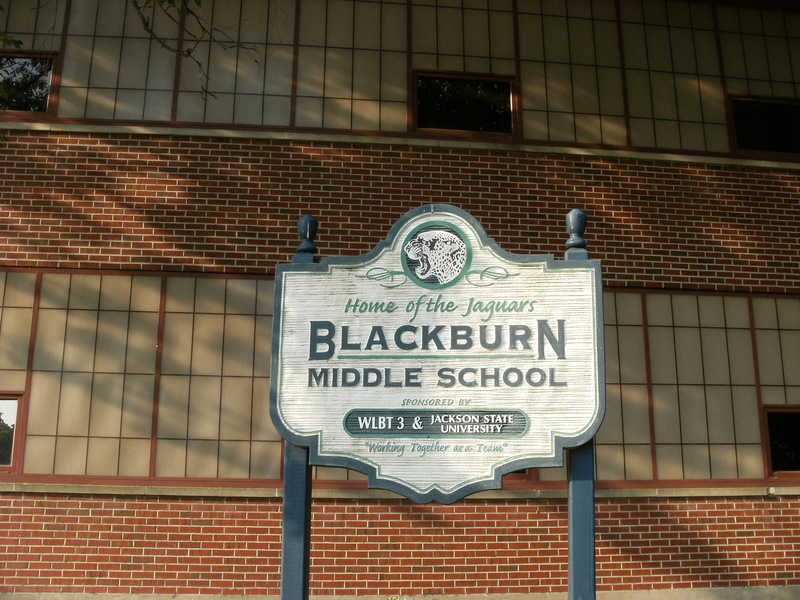 Blackburn Administrators and Parent Teacher Association are inviting community members and former Blackburn, Jim Hill (Jr. and Sr. High), and Sally Reynolds graduates to attend the Last Public Tour of Blackburn Middle School. The tour will take place today from 5:30 p.m. – 7:00 p.m.
During the event, You will also have a chance to purchase a commemorative brick salvaged from the old school. Your purchase will assist with the efforts of Blackburn’s Parent Teacher Association (PTA), and will be installed along a commemorative wall in the library of the new Blackburn Middle School. The first 100 bricks sold by May 20th will be installed along this wall and can be personalized to include an engraved name or special message. A reception will take place in Blackburn’s gymnasium. This is the same place where the first graduation ceremony of Jim Hill Sr. High School (previously Jim Hill Jr. High) was held in 1953. This event is a great chance to tour the same building in which Richard Wright and countless others have been educated. For more information, contact Blackburn Middle School at 601-960-5329. Blackburn is located at 1311 W. Pearl Street and is on the corner of W. Pearl and Dalton Streets. Thank you Curnis! I would not have known about this and would have missed the tour and brick purchase taking place this evening! Curnis: Thank you soooo much. I took the tour and left a little sadder but proud. Had a change to run into “Radar” (that would be Mr. Gentry) aptly named because nothing got by him and I mean nothing! Could you please ask your readers if anyone took photos they can share? I would like to send some to my brother in SanDiego. Thanks again! You’re very welcome, Renee! I took some photos while I was there and I plan to load a few of them on the blog early next week. The rest I’ll post on Facebook. I also ran into a guy who had a MUCH nicer camera than mine at the school, and he said that he’s going to upload them to SmugMug. I’ll be sure to post a link on here as well once he uploads the pictures. Take care!